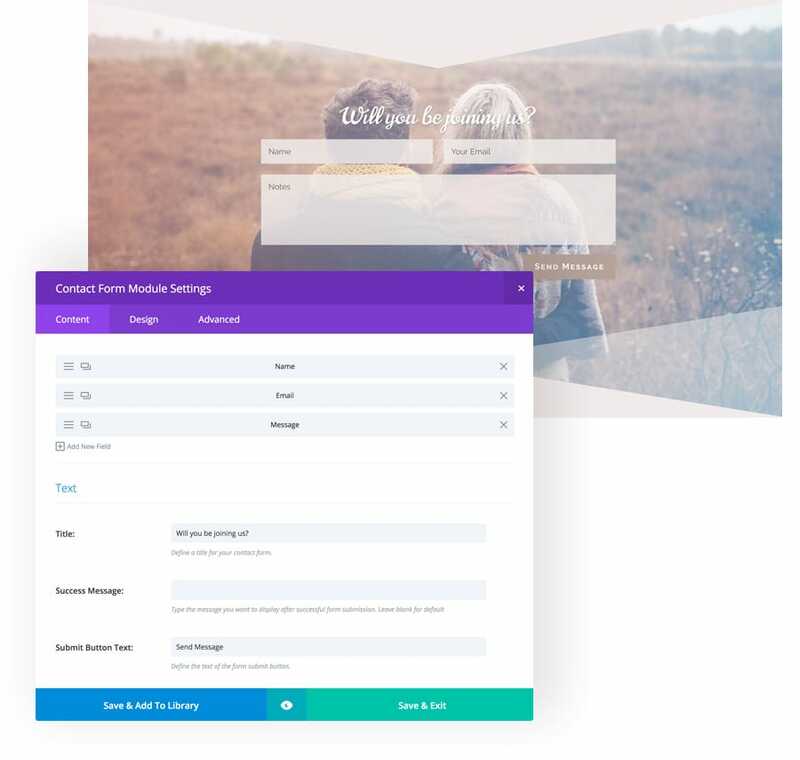 Happily is a free Divi layout made for all the lovely Brides and Grooms out there, who are looking for a simple way to connect with their wedding guests. Happily is a responsive Divi layout with a clean, elegant design and a beautiful color combination and custom wedding icons. It can be used as a complete wedding website. Requirements: The Happily Divi layout requires that you have the Divi parent theme for WordPress installed (version 3.0.101 and up). It is not included with this product. 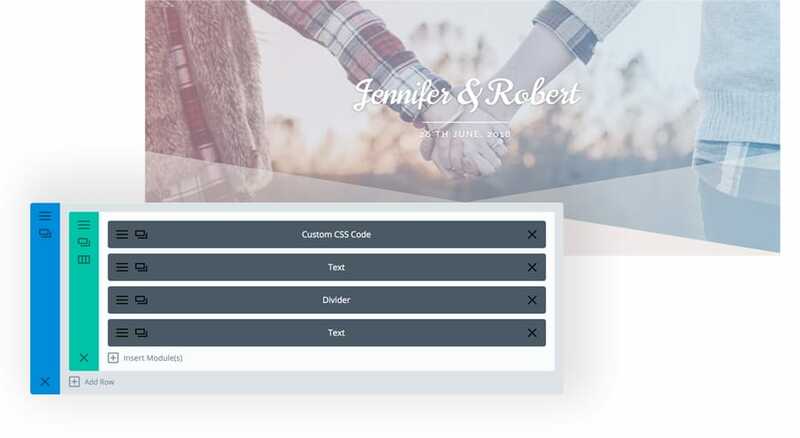 In the first section – you’ll find 4 modules: CSS Code with some custom CSS code, Text – the main heading with the names of the happy couple, Divider – the line underneath and Text – the date of the event. 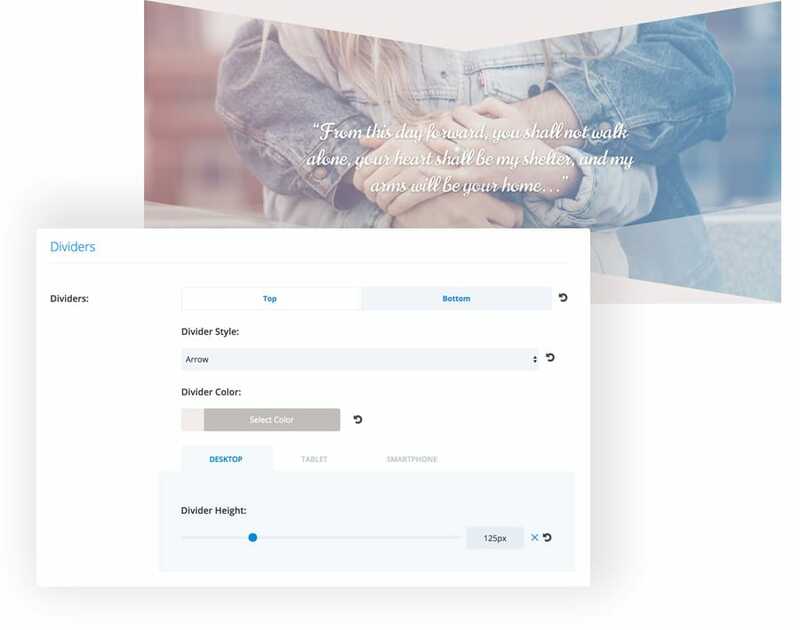 You can move the CSS code to the page settings, or Divi Theme options (Custom CSS field) or to your child theme stylesheet – whichever works best for you. The main image is set as a section background. It has a gradient overlay and the blending mode is set to Screen – you can play around with that settings and see what will work best for your own image. The second section uses some custom CSS for a better mobile view. The Groom row uses a reverse-column technique to display the right column with the image before the left one with the text on smaller screen sizes. All of the Text modules and Social Follows are aligned centered on mobile, and right/left for desktops. The Happily layout uses the wonderful new Divi feature – the section dividers. They were introduced in Divi version 3.0.101, so make sure your Divi theme is updated. The images inside the Gallery module don’t get imported with the JSON file, so you’ll need to add images separately – otherwise the gallery slideshow will be hidden. 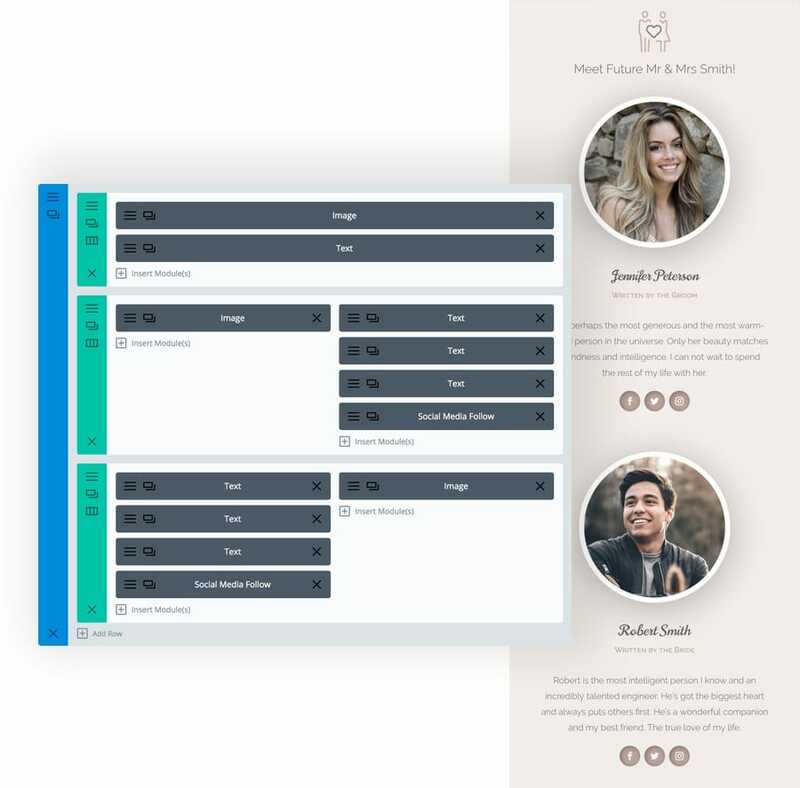 The bottom section includes a pre-styled Contact From module, which invites the wedding guests to get in touch and gives them an option to quickly send their RSVP. You can easily add additional fields to the form (like the option to choose the meal preference or add the name of the “plus one”). We hope you enjoy this layout and that it will be usefull. If you have any questions, please feel free to ask and we will try to answer as best as we can. The layout needs to be imported directly on the page, not in the Divi Library (as per instructions), and it works with WP 5.0. I like your wedding layout and put a link to it in our german article about recommendable Divi layouts. PS: This is the third time I try to comment. Till now every comment was suggested as spam, but till now I can’t figure out why your system thinks my comments are spam!? Thank you, Ania. I’m inspired by your work and knowledge! Your videos, resources and themes are very helpful to me and I hope to see more videos from you! I like it because unlike other websites it is for before the wedding. It is very stylish. Great job!